O: I want the apple drink, it's green! I was wondering if this beer would actually have a green tinge to it. Well, after months of waiting, I am pleasantly surprised that it is green. The beer itself is rather charming as well. It has that Fantome charm with an additional level of fruit and spice. Apparently this was only brewed once, but it's worth trying if you have a chance. It's green. Unique. Very yeasty. Aroma suggests grass and herb. Taste delivers on that promise, yielding a sage and mint emphatic beer. Tingly white pepper appears throughout alongside coriander seed and clove. Pink peppercorn. Rife with spicy subtleties, Vertignasse is a treat of a spiced Belgian saison, though those after a saison with plenty of brettanomyces funkiness would do well to look elsewhere. 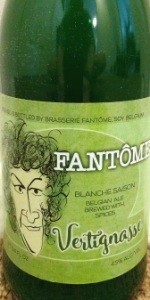 Not quite top tier fare within the style, but one need only look into Fantome's own (other) expressions thereof to find those beers that best it. Fantome's experimentation is interesting as always; though this isn't quite as incredible as the very best Fantome saisons out there, it's still easily in the stratosphere in terms of quality and may well be the most innovative saison I've had in a few years. A must-try for any discerning saison drinker even at $15ish a bottle. A: The beer is hazy lime green in color. It poured with a short white head. S: Light aromas of wheatgrass and limes are present in the nose. T: Similar to the smell, the taste has flavors of wheatgrass and limes. O: This is definitely an interesting green beer. It was easy to drink and I liked the flavors of wheatgrass and lime. A-The beer poured a surrealistic green color with minimal head and lacing. S-A combination of spicy and sour aroma, somewhat unique. T-The taste follows the aroma with a combination of spices and a slight distinctive sourness. O-A very unique beer with what seemed like a combination of a typical farmhouse ale and american wild ale style beer. Bottle: Poured a deep green color ale with a nice large foamy head with good retention. Aroma of chlorophyll and wheat malt with light spices is intriguing. Taste is a mix dominated by chlorophyll notes with light wheat malt with some spices notes that are quiet subdued (coriander?). Body is about average with good carbonation. Interesting color with a unique taste profile. this is not for beginners or intermediates, thats a fact, this ambitious and weird brew is obviously designed to appeal to a more sophisticated beer drinker, someone who can appreciate the risks taken and see this beer in a larger context. i thought it was splendidly bizarre, and would like to know a lot more about it, but information is scarce to say the least. it pours a juiced vegetable green color, really chlorophyll fresh looking, relatively thick, and quite foamy too. hazy in its green, but this isnt a tint or a suggestion of green, its full on green. the oddest part of it, i have no idea what even accounts for the color. i know in the fantome magic ghost its green tea, but i dont get a lot of tea here, i get more citrus and grass, maybe lime and wheatgrass to be specific, although im not sure lime would impact the color much. there is a distinct candied lime character in the nose and the taste, and its really nice with the weird fantome yeast, somewhat more wild and bretty than a lot of their other beers, but with the same saison spiciness. the base beers seems wheat based to me, but there is so much herbaceousness and lefty green happening here that i am distracted from the beer underneath and almost focused entirely on this strange green element. citrus for sure in the flavor, maybe an herb of some kind, its slightly medicinal, but its also really dry and clean and fresh by the end of it, a little bitter, and very well carbonated. i finish as confused as i started. you never know what you are getting with these fantome beers, and i was sure surprised to see this pour crayon green, but what a cool beer it is. if anyone has any more information about it, please share!!! Look: Bright green with two inch white head. Smell: Ginger, lime, and spices. Taste: Taste follows the nose with ginger, lime, and spices. Overall: A nice refreshing saison. Pours cloudy murky opaque dark lime green gold with a creamy frothy white foam head. Smells like limes, lemony citrus, funky peppercorn spice, some clove, banana, pale crackery bready malt, with floral woodsy earthy herbal grassy pine. Tastes like fresh limes, lemony citrus, peppercorn spice, some clove, banana, pale crackery bready malt, with floral woodsy earthy herbal grassy pine. Feels medium-full bodied, creamy with moderate smooth carbonation. Overall a really nice and unique saison. Pours a bizarre green. Its almost the same green as the bottle it came out of. A bright fizzy head came out but settled to a highly carbonated white foam ring. Never have I had a green beer like this. The smell is stale earthy barnyard with straw and a bit of Meyer lemon. Taste starts earthy and mildew with rain soaked wood and straw again. A candy sugar sweetness overpowers and ends with the lemon again and a touch of mandarin orange. A grassy wheat taste and a fruity pear is there but gets lost in the sweetness honestly. Its good, but too sweet and throws off the balance overpowering the other flavors. Overall, this is a fascinating brew. Very happy I tried it, but just a little too sweet. Poured from 750 mL bottle into tulip. A: Pours a distinct green hue with hints of yellow about the edges. 1 inch bubbly white head that fairly quickly recedes. Definitely interesting looking. S: Maybe the color is influencing me, but I first pick up tart green apple, quickly followed by white pepper, earthy spices, mildly funky yeast, and a hint of tart citrus (must be the grapefruit). T: Mild grapefruit followed by stronger white pepper, clove, and an earthy mustiness. Finishes with a faintly sweet note akin to apple candy. M: Light body. Almost no carbonation...it would have been nice to have an effervescent kick. Mild fruit sweetness and acidity. D: Honestly, this is the first green beer I've had. It was interesting...and not bad. Glad I tried it, but don't think I'd seek it out again.